Bethesda hasn’t been shy when it comes to its ambition for Fallout 76. While we’ve already seen the Fallout 76 map, it’s another thing to actually traverse through it. If you’re wondering just how big the actual map is, well, we now have an answer for you! Sort of. YouTuber 2Franks did the arduous task of walking Fallout 76’s map from end to end, and timing it, and it took him a long 35 minutes to do it. He’s not just walking, of course. There’s some shooting, looting and all sorts of stuff happening in between. Still, 30+ minutes to walk through the entire in-game map is insane. Is there even a game that matches it in terms of map scope? In other Fallout 76 news, Bethesda has outlined (see below) some of the bug fixes and features the studio is planning to roll out before the year is done. Are you playing Fallout 76? Do you think it matters if the map is this massive or it doesn’t matter if there’s nothing to do? 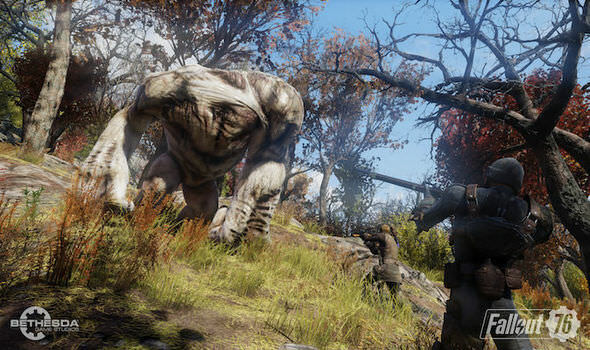 Bethesda has also revealed that the first patch for Fallout 76 will drop this Monday, November 19, and is full of performance fixes and optimizations. November 19 Patch – The next update will focus primarily on game performance and stability on all platforms but will also come with a list of fixes to quests, UI, C.A.M.P.s, and more. Patch notes will be available early next week. This update will be large compared to what we expect for patches going forward. Regular updates will always vary in size, but future updates should be much smaller in comparison. Stash Limit Increase – We hear you loud and clear. We will be increasing the stash limit in the coming weeks. The current limit is there for technical reasons, to cap the number of items the game is tracking in the world, including every container and stash. We believe we have some ideas in both the short- and long-term that will address the size without risking stability, but this is one we need to take our time on to make sure it is done right.